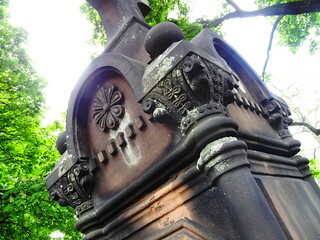 A cemetery can tell you the story of a city; where residents came from, who was rich, how streets got their names, it can be fascinating stuff. 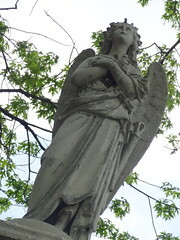 Today we are visiting Mt Elliott Cemetery on, well, Mt Elliott, just north of Lafayette. 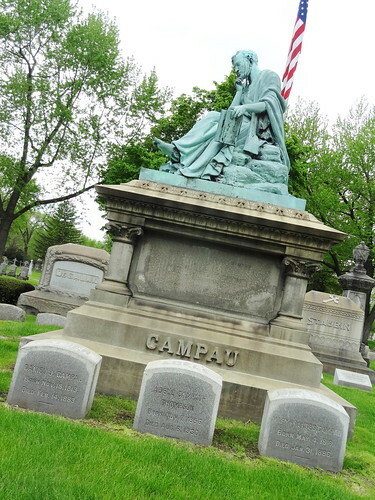 The oldest, still operating, traditionally Catholic, cemetery in Detroit, it was consecrated in 1841, just 4 years after Michigan became a state. 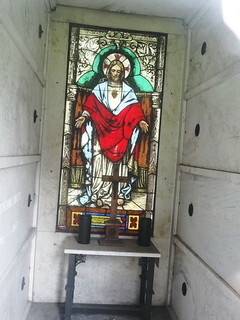 The first burial was that of Robert Elliott, notice the name? 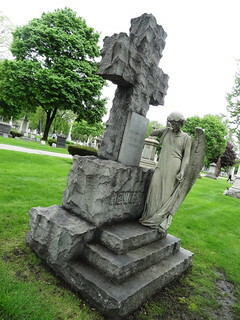 Elliott was one of the original purchasers and planners of the cemetery, one month after it opened, he was killed in a construction accident at St Mary’s, it was named ‘Mount Elliott’ in his honor. 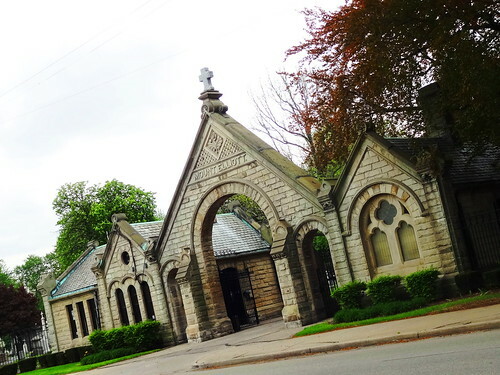 We enter through a beautiful stone gateway designed and built by Walter Schweikart in 1882; many prominent families are laid to rest near the entrance. The grass is green and lush, the spring breeze a bit chilly, monuments and tombstones rise from the ground as far as the eye can see. Directly in front of us is the monument of a barefoot scholar belonging to Daniel Campau, son of Joseph Campau, yep, that guy. Surrounded by books, the man looks deep in thought, as if he is pondering some eternal question; his father, Joseph, is buried at Elmwood. We traverse the grounds winding past grave sites; it is tranquil, serene, the only sounds come from the rustling of leaves and songs of the birds. A canopy of mature trees seem to exist to protect those who have passed on. 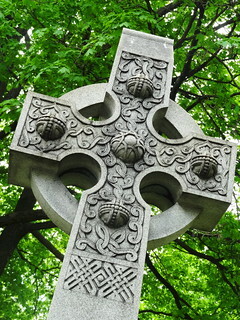 Crosses come in all sizes here; carved of stone, one resembles a log while another has a Celtic design. 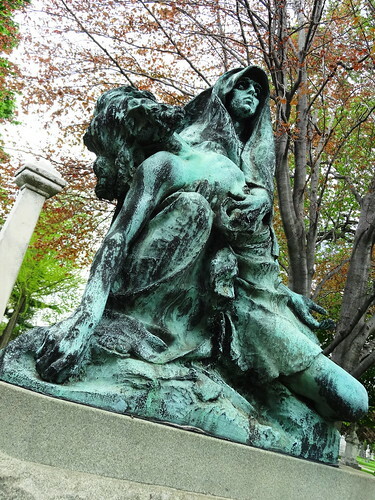 There are multitudes of statues gracing monuments; angels, women in flowing robes, they all wear grief stricken, sullen expressions, some turn their faces upwards toward heaven. Some headstones are barely legible, weather has taken its toll and worn them nearly smooth, one monument has become very dark, it looks long forgotten. A tiny lamb sits atop a stone rectangular box, details have been washed away. 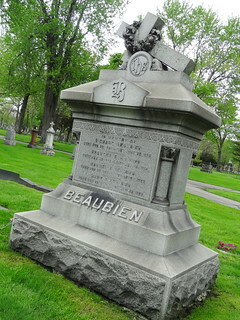 In 1872 the Fireman’s Fund bought large lots for $500 apiece for the purpose of burying firefighters; the Fireman’s Fund Monument stands tall over the headstones, annuals have already been planted in the urns, two red, faux fireplugs flank the site. 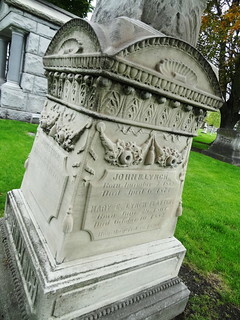 Jerome Cavanagh, Mayor of Detroit from 1962-70, is buried here, as are many French and Irish settlers, soldiers that fought in the American Revolution, the War of 1812, for and against Napoleon in the Battle of Waterloo and the Polar Bear Expedition to Russia after WWI. Little Chief Edward, grandson of Sitting Bull is laid to rest here; the well-known and unknown are entombed side by side. 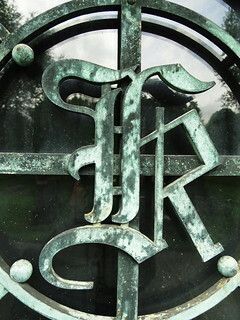 The mausoleum architecture is elaborate, fancy, graceful. The Palms is my favorite; framed by a Crimson King Maple on each side, the structure is beautiful; a few steps lead to metal doors that have tarnished over time, creating a lovely patina, short columns flank the entryway, a statue of a woman is positioned on top. The Palms family were Detroit high society through real estate and banking; they have left an architectural legacy in the Palms House, Palms Apartments and Palm Theatre (now the Fillmore). 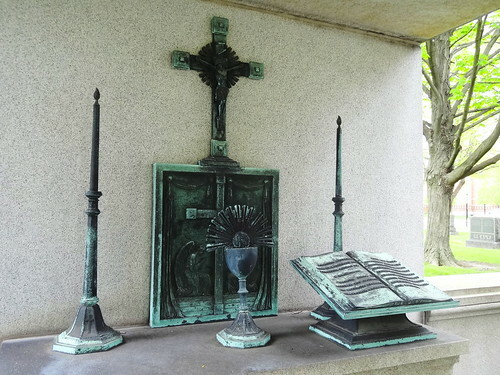 We pass familiar names such as Beaubien, St Aubin and Moross; most mausoleums have gorgeous metal gates, some, ornate stained glass windows, iron grates and urns waiting for flowers to be planted. One tombstone resembles a church steeple, another a tree stump with a log cross, where the bark is ‘peeled’ away we learn the names of those who have passed on. 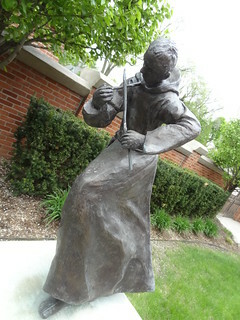 Crossing Mt Elliott, we find ourselves in front of St. Bonaventure and the Solanus Casey Center. St Bonaventure Monastery, constructed of red brick with limestone trim, built for the order of Friars Minor Capuchin, opened in 1883; Father Solanus Casey was a Friar here from 1924-1946. 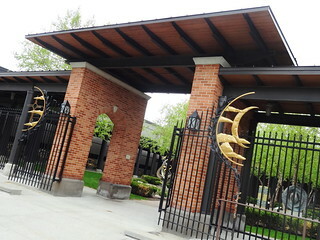 At the Center we pass through the open gateway into the courtyard; brick pavers are engraved with names of donors, large pieces of sculpture dot the garden landscape. 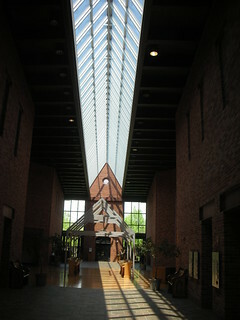 A pair of impressive glass doors lead us into the building; sunlight floods the interior corridor. 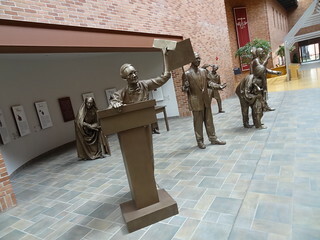 A group of bronze statues are to our left, glass cases display items used by the monks; robes, chalice, sashes, habits, sandals and wood rosary beads. A narrow doorway leads us to a series of exhibits detailing the life of Bernard Francis Casey; born in 1870, he was the sixth of 16 children. 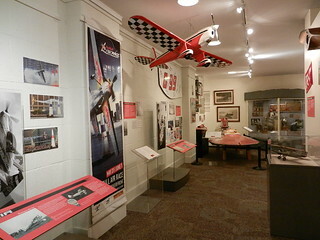 There are family pictures and personal items; stories from childhood through adulthood appear on placards, giving us insight into this revered man. 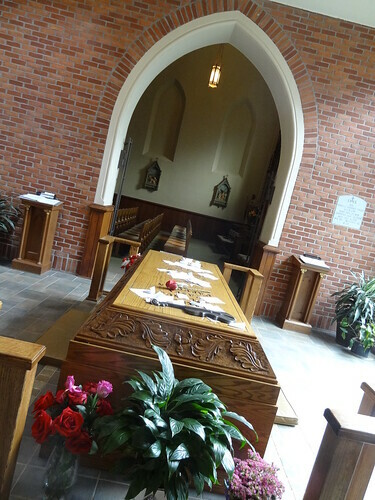 Father Solanus Casey’s casket lies beneath the north trancept at St Bonaventure’s; today a single red rose and small folded pieces of paper sit atop the wooden tomb; prayers offered for the intercession of Father Solanus. Known as a ‘wonder worker’ he is the first United States-born man to be declared ‘venerable’ by the Roman Catholic Church; he has been proposed as a candidate for Sainthood. The church is quiet, we are the only ones here. 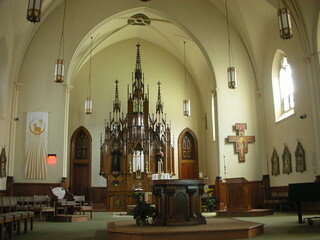 The Gothic Revival style is simple and elegant; highly varnished wood wainscoting covers the lower half of the walls, classic lantern-style lights hang from chains. Light streams in from understated stained glass windows that face Mt Elliot, the main focus of the space is definitely the meticulously carved wood altar, magnificent with its tall spires. We exit through a rear door that leads to the Votive Candle Chapel, enclosed in glass it provides a lovely view of the grounds. Tiny flames dance inside tall red and green glass jars; the scent of melting wax permeates the air, it is familiar to me, many of the old churches smell exactly like this, I find it pleasant and comforting. A few people arrive with new candles purchased in the gift shop, they will replace ones that no longer burn with their own prayers. 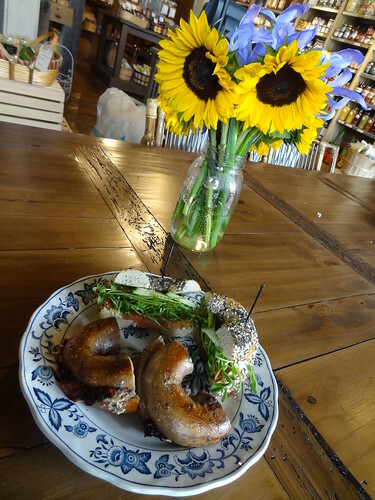 We leave the serenity of the Center and head to Eastern Market to grab a late light lunch; Germack is now serving bagel sandwiches in their coffee shop–perfect! We place our order at the counter and have a seat at a nearby table, I sip on a hot Chili Mexican while we wait. Our sandwiches arrive and they both look delicious; Kris has a PBJ: Germack’s own freshly ground cashew butter and a layer of a locally made blueberry lavender vanilla jam on a Detroit Institute of Bagels blueberry bagel, if you think it sounds good, you should taste it! I went with the Morning Sunshine–house-made herb cream cheese, cucumbers, tomato and arugula on an everything bagel, yum! 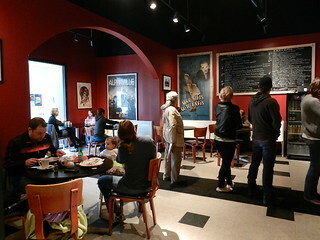 When our sandwiches are gone we sit back and chill as we finish our coffee, it has been another great day in Detroit. On The Rise Bakery is located at 6110 Mc Clellan at Gratiot, it is housed in a beautiful historic yellow brick building with Pewabic tile accents. 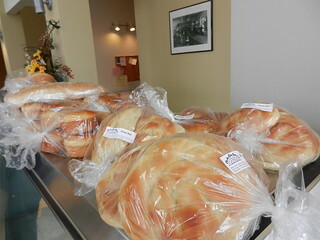 Inside you will find large round loaves of fresh-baked bread, cupcakes, muffins, several varieties of cookies the size of saucers, and much more. It smells wonderful inside, everything looks delicious, prices are reasonable, and staff members are friendly and helpful. 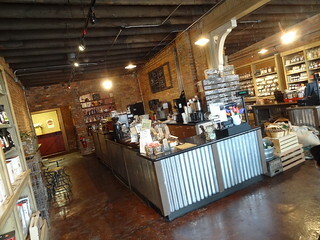 We were there on a late Friday morning, along with a constant flow of patrons coming and going. On The Rise is sponsored by the Capuchin Soup Kitchen; your purchase supports housing, training, counseling services, educational opportunities and self-help programs for men recently released from prison or those who have completed a substance abuse treatment program. I chose a loaf of Monastery White bread, great for sandwiches, or perfect french toast, and was not disappointed. Located outside the ‘tourist zone’ this is a fun stop for the more adventurous. 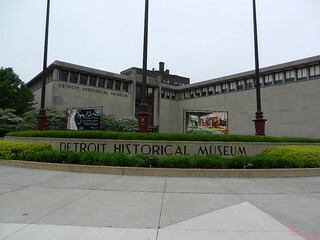 The Detroit Historical Museum was established in 1928 and is one of America’s oldest public museums dedicated to metropolitan history. We found a metered parking space on Kirby, there is also a pay parking lot adjacent to the building, the cost is $4.00. As you climb the few stairs to the main level you will currently find the Fabulous 5 display, in it is one of Diana Ross’ beaded dresses, I had no idea she was that tiny. Things are still done the old-fashioned way here and it has a quaint feeling to it. If you haven’t been here in ages memories will come flooding back as you wander the Streets Of Old Detroit or marvel at the Glancy Trains. 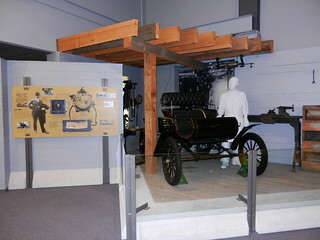 The Motor City exhibit is a multi-faceted look at Detroit’s auto industry; covering invention, assembly, labor and suppliers. 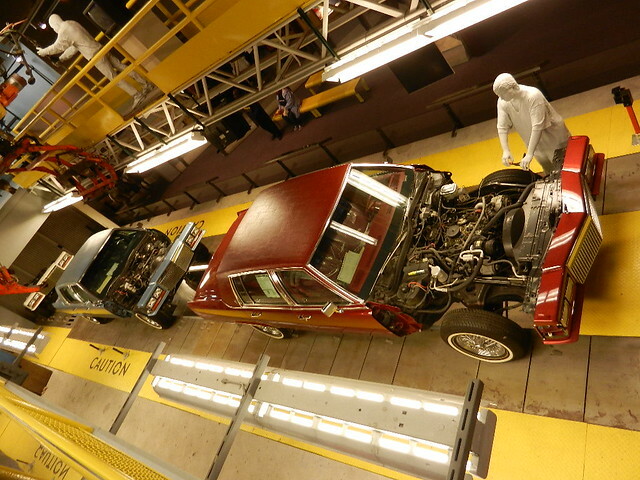 The centerpiece being the assembly line featuring the Cadillac Clark Street plant “Body Drop” acquired in 1987, and several vintage Fleetwoods. 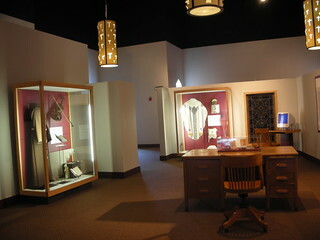 In addition to the permanent collection there are a number of changing exhibits. I love the current “Saying I Do” Detroit Weddings showcase, it explores the traditions surrounding weddings and marriage of different nationalities found in metro Detroit. Over the years we’ve seen: Hudsons, Historic Movie Palaces, and vintage toys to name a few. Detroiter or not come check it out. 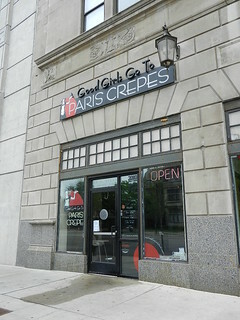 Good Girls Go To Paris Crepes is located right across Woodward from the museum and makes a great lunch stop. Park on the street and head inside the lipstick red walled dining space. The menu is posted on a large chalk board hanging on the wall, the Right Bank features sweet crepes, and the Left Bank savory. One of each is a nice combination, packed full of fillings these crepes are meant to be eaten with a knife and fork, large enough to share, we cut each in half and split. Our selections this time were the Janel, filled with eggs, swiss cheese, ham and pesto, and the Mary which is simply cinnamon, sugar and butter. It is astounding how something so simple can be so flavorful. Order at the counter then have a seat at one of the tables to wait for your food to arrive. Check out the French movie posters displayed on the walls, watch the activity on Woodward through large front windows to pass the time. It can get crowded, but the line usually moves quickly and I think it’s worth the wait. UPDATE: Good Girls Go To Paris is now closed. 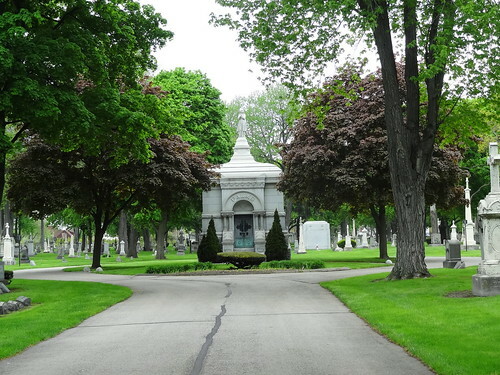 Within about a mile of Jefferson on Mount Elliot there is an interesting variety of places to see including two historic cemeteries, a riverfront park, East Riverwalk and our destinations of the day. 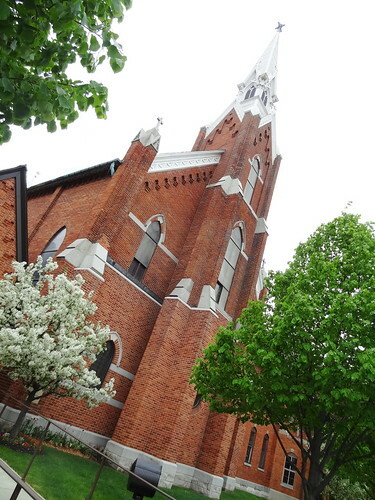 The Solanus Casey Center is located on Mt Elliot in Detroit. 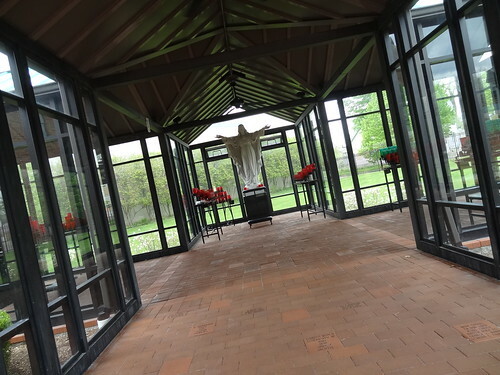 Inspired by the life and example of Father Solanus the center strives to be a place of pilgrimage, healing, reconciliation and peace. Father Solanus was well known in Detroit throughout his more than twenty years of service at St Bonaventure. His ministry of charity, comfort, and concern for the poor inspired the Detroit Capuchins to establish their Soup Kitchen which continues to this day. 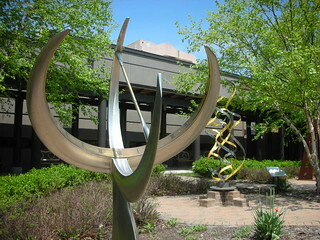 The center welcomes people of all religious backgrounds and all walks of life. 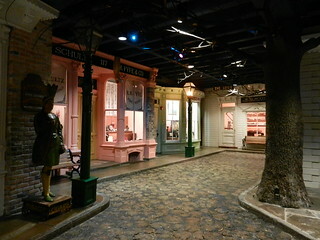 Park on the street, then walk through the garden on your way inside. 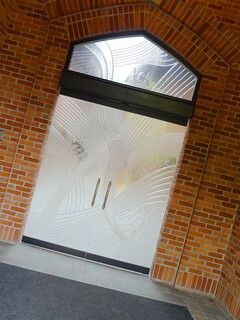 When you enter the building through the beautiful glass doors you will notice an instant sense of tranquility. Skylights flood the lobby with sunlight and it draws you further inside. 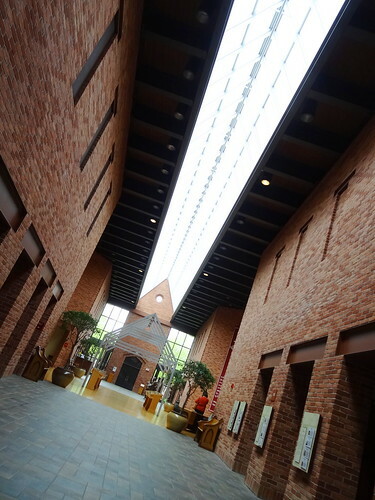 There is a small museum like section that tells the story of the life of Father Solanus that I believe anybody would find interesting. He spent his life in the service of others, in times of trouble and sorrow people sought his prayers and advice, many still pray to him today. 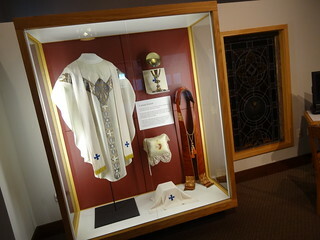 The St Bonaventure Chapel is connected to the center and is open daily from 7:30-5:00pm. 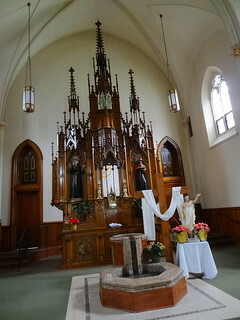 Be sure to wander in, religious or not you can’t help but admire the intricately carved wooden alter, the architecture is simple and elegant at the same time. Feel free to have a seat, it is a perfect place to meditate or reflect. 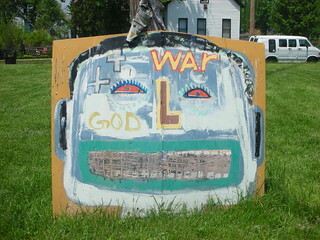 Just a short drive away is the Heidelberg Project, these two places couldn’t be more opposite. Here there is a sense of energy and controversy, it feels loud. The colors are bright, houses are painted with polka dots and numbers, found items are grouped together in unlikely collections. It challenges you in a way that is whimsical not offensive. Walk the two block area with an open mind, just have fun. 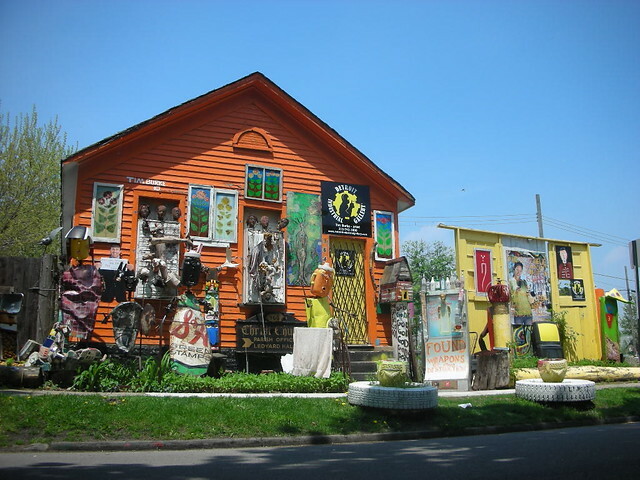 The Mission of the Heidelberg Project is to inspire people to use and appreciate artistic expression as a means to enrich and improve their lives, and to beautify and preserve the environments in which we all live, work, and play. 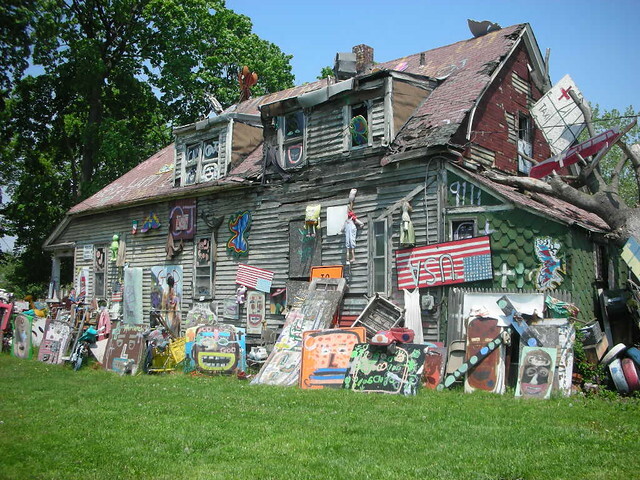 Tyree Guyton created the Heidelberg Project 25 years ago, in an effort to bring positive change to his community and the city of Detroit. 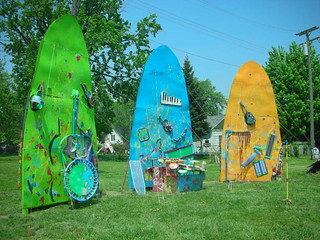 It began as an outdoor art project in the heart of a blighted neighborhood in Detroit, but has grown to be much more. 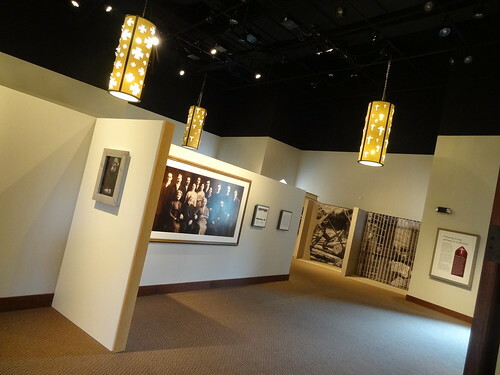 Today the project is recognized as one of the most influential art displays in the country. 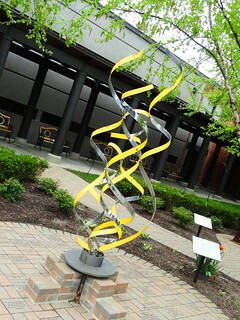 It is a demonstration of the power of creativity and its ability to transform lives. Each day the project attracts visitors from all over Detroit, the nation and the world. It offers a seed of hope, a forum for ideas, and a bright vision for the future. After all of the activity it was time to go to Southwest to Cafe con leche, this is the coffee shop I mentioned in an earlier post. 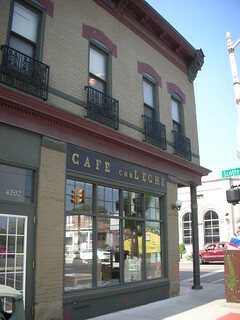 It is one of our favorite places to go and have some sort of espresso drink, sit at a table in the window overlooking Clark Park,and watch. In warm weather or cold, Kris always gets a large Cubano, it is wonderfully rich espresso that is brewed directly into a cup containing raw sugar, so the espresso and sugar mix together, then it is stirred gently and enjoyed. My selection varies from visit to visit, but when it is cold outside you can’t go wrong with a Spanish Hot Chocolate. Owner Jordi comes from Barcelona Spain, so he knows how to make them right. Hot chocolate so thick, you can eat it with a spoon! It has almost a pudding like taste and texture to it, heck, it’s so good, get it anytime. This cafe has a loyal following, regulars come and go at the same time each day, the baristas greet them on a first name basis, and ask “your usual”? It is comfortable and friendly, Spanish is the primary language being spoken, but people easily change back and forth to English, and there is usually a nice selection of music being played quietly in the background. They offer a small selection of mostly Mexican pastries, and they recently added Panini sandwiches. 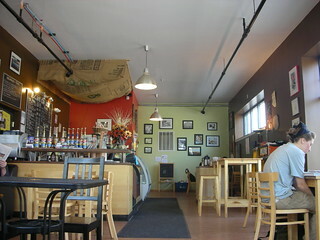 Located at 4200 W Vernor, it is a great place to kick back and relax and just hang out.